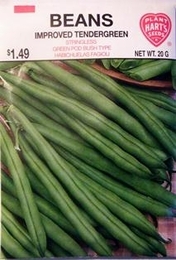 This popular green bean produces abundant yields of round, stringless pods on vigorous bush type plants. Pods are about 6 inches long and have a distinctive bean flavor. Resistant to common bean Mosaic. For best crop, keep free of weeds, Do not hoe when wet. For highest quality yield, pick pods when young about 4 to 5 inches long. For continuous crop, make successive plantings every 2 to 3 weeks until mid summer. Thinning - when plants are 2 to 3 inches, thin to 3 inches apart. 1300 Seeds/lb. Plant 1lb per 100ft row. 70-90lbs of Bean seed needed per acre. Average Bean yield per acre - 172 bushels.